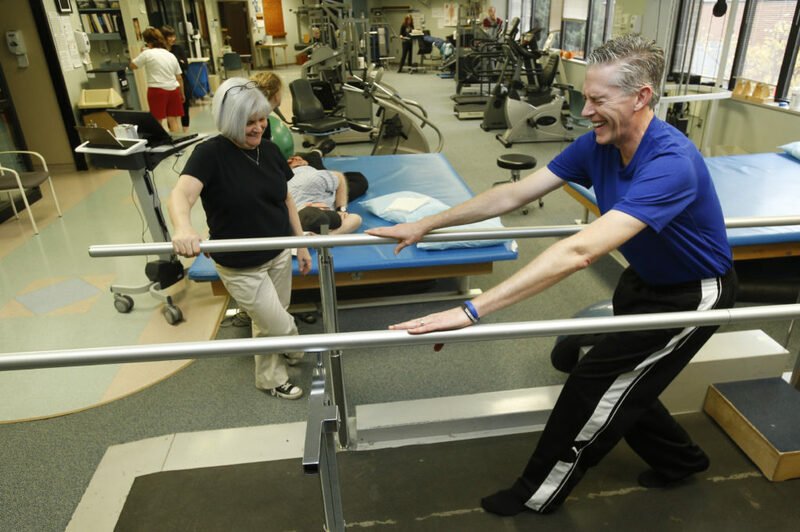 Lawrence resident Sam Porritt laughs while working on strengthening exercises with Lawrence Memorial Hospital physical therapist Karen Bayouth on Wednesday. Porritt, who is making a comeback from paralysis below the waist after falling from a ledge in Italy in 2011, has created the Falling Forward Foundation to assist those in recovery situations like his with paying the cost of rehabilitation that insurance will not cover. 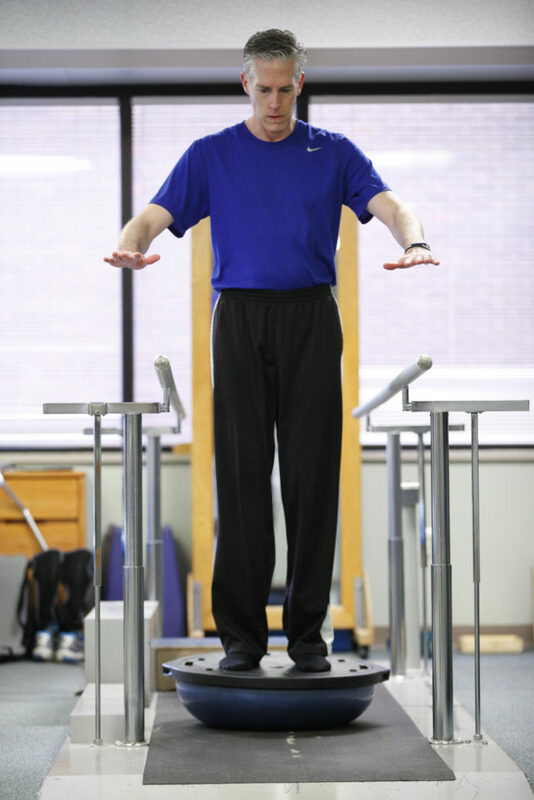 Lawrence resident Sam Porritt balances himself during a therapy session on Wednesday at Lawrence Memorial Hospital. As Sam Porritt stared up at the Italian sky, unable to move his legs, one thought crossed his mind. Moments earlier, the Lawrence marketing consultant had been taking pictures of the beautiful scenery in the country’s Tuscany region, where he was vacationing with his wife, when he lost his footing and fell, forward, off a 15-foot wall. He was paralyzed. When he regained consciousness, he quickly became resigned to the fact that would spend his remaining days incapacitated. Fast forward to two years later. On a recent day, Porritt’s physical therapist holds his cane as he attempts to walk a few dozen yards without it. He’s also without the braces he normally wears to get around. Porritt, in a blue T-shirt and black sweatpants, moves forward one deliberate step at a time, almost tipping over and veering off center at times. But he makes it. Phew. Rewind to a few weeks after the accident, when Porritt and his wife, Leann Johnson, were meeting with the intake officer at the Rehabilitation Institute of Kansas City. “We walked into the room and literally her first word wasn’t ‘Hello.’ Her first words were, ‘You have amazing insurance,'” Porritt said. Porritt and Johnson were floored. They knew they had decent insurance — Johnson chose a plan with above-average coverage because her doctors were in its network — but amazing? Turns out it was. Unbeknownst to him, Porritt had coverage for unlimited physical therapy visits, which is essentially unheard of. He still didn’t realize the practical implications. Not long after, Porritt was doing therapy at the Rehabilitation Institute, the gym filled with patients. Porritt took his regular position at the end of the parallel bars and started walking to the other end, his hands not touching the bars. As he reached the other side, he started sobbing uncontrollably. It was his first realization since the accident that his life wasn’t over. A fellow patient looked at him. “I think you got an early Christmas present,” she said. Despite the joy surrounding his own improved condition, Porritt would come home from therapy feeling disappointed. Another patient had graduated from the rehab facility, he told his wife, not because he was better, but because his insurance coverage had maxed out. Porritt discovered that most policies cover 20 to 30 therapy visits a year. That means that if he had been most people, his rehab would have concluded shortly after the walked to the end of the parallel bars on his own for the first time. But what? He knew that changing the rules governing insurance would be nearly impossible — just look at the controversy surrounding the Affordable Care Act. But what if he could help pay for those people with insurance limits to stay in rehab? That’s really all he wants — for everyone to have the same opportunity he did: the chance to get better. Fast forward a little more than a year after Porritt’s accident. Molly Ogden wakes up one morning for school one morning at her family’s Baldwin City home unable to speak. It quickly became apparent to her family that something was wrong. Terribly wrong. The teen had suffered a major stroke. After weeks in the hospital, including times where it looked like she might not make it, Ogden began her rehabilitation. She would have to learn how to walk and talk again, essentially starting from scratch. Her family learned her insurance policy would allow 100 days of therapy over the next year, so they spaced them out accordingly. And like many people in physical therapy, Ogden has had to supplement her visits with at-home exercises. She also does horse therapy offered by a neighbor who does it pro bono. Still, Alison Ogden considers her daughter lucky. She knows parents of kids in similar situations as Molly’s whose insurance allowed only about a third as visits. What do patients generally do when they run of visits? As momentum for his effort started building, Porritt asked around: Who might be able to help me get a foundation off the ground? A mutual friend put him in touch with Kansas Insurance Commissioner Sandy Praeger, who told Porritt that, yes, insurance limits are an issue for physical therapy patients and, yes, she would be willing to sit on the board of his foundation. Along the way, Porritt has had to convince people that this foundation isn’t meant for only the less fortunate but nearly everyone. If someone questions his motives, he tells them to go home and check their insurance policy, to see how many therapy visits they’re allowed. Some of his friends have even bought supplements to their policies to increase their allowable days in therapy. That’s another goal of the foundation: to spread awareness, to get people to examine the fine print in their insurance policies and amend them accordingly. The foundation just needed a name. It seems obvious in retrospect: Falling Forward. “Everyone’s like, ‘Oh, you fell forward.’ That’s the obvious reason for the name,” Porritt said. “But to me, the most important word is ‘forward.’ That’s what this whole thing is about: helping people move forward in their lives. Fast forward exactly two years from the accident. Falling Forward is official. The foundation has made a 10-year commitment to Lawrence Memorial Hospital Therapy Services and the Rehabilitation Institute of Kansas City. But that’s a base-level commitment, Porritt said. To fully meet the needs of physical therapy patients in the region, he said, the foundation is continuing to raise money. Now comes the hard part: identifying patients who need to continue rehab but can’t for insurance reasons. Porritt is leaving that up to the therapists at LMH Therapy Services and the Rehabilitation Institute of Kansas City. The patients can then apply for a Falling Forward grant. Porritt’s foundation is an experiment of sorts, because, as far as he can tell, no one’s ever done anything like this before. But it’s not for a lack of need. Even if this issue affects a relatively small percentage of physical-therapy patients — some of Porritt’s initial estimates put it at 10-15 percent — its cost to society is likely far higher. Anyone who’s spent any time with Porritt can tell this means everything to him. For one, he can’t help but cry every time he tells his story. For another, it’s now his full-time job. While the former marketing executive for Payless ShoeSource still practices that profession on the side, he’s dedicating the majority of his time to making his foundation a success.